Want to learn to craft with plastic canvas? This plastic canvas how to guide can teach you the basics and have you creating in no time! 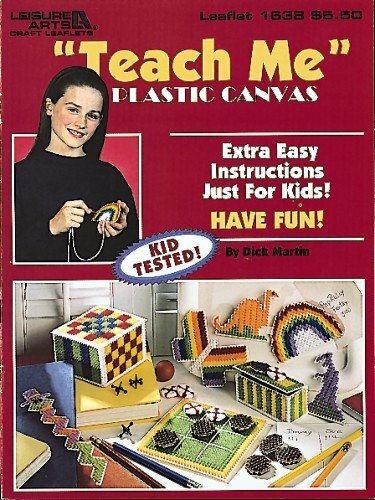 Have you always wanted to learn to craft with plastic canvas? This plastic canvas how to guide was created in the hopes of introducing more people to this versatile and fun craft. I learned to craft with plastic canvas when I was a little girl. I remember one year, my grandmother made me an Easter basket from plastic canvas. I loved it so much, I asked her to teach me how to craft with plastic canvas. Although I love crafts of all kinds, to this day plastic canvas is probably my favorite craft to do. On this page, you will find all sorts of information on getting started with plastic canvas, how to make basic stitches, and some simple patterns. In no time at all, you will be making your own plastic canvas tissue box covers, coasters, and more! ✅ No time to read this now? Click here to pin this information for later! First, lets learn a little bit about plastic canvas terminology. Plastic canvas is composed of bars and holes. When cutting a pattern piece out of plastic canvas, the pattern instructions will usually give you the dimensions in terms of number of holes or number of bars. 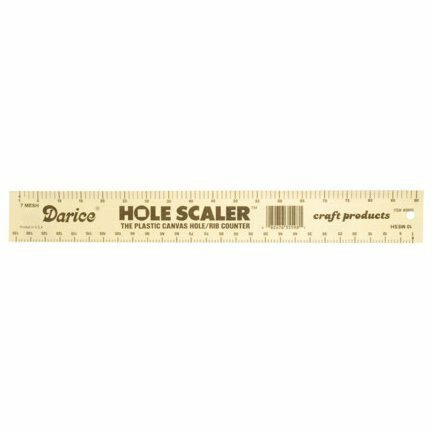 When the dimensions are given in holes, make sure you keep all the bars surrounding the holes intact as you cut out your piece. The most basic of plastic canvas stitches is the continental (also sometimes known as the half cross stitch). The continental is stitched on a diagonal across a bar. You bring the yarn from behind the plastic canvas through the hole to the front (1). Then you put your needle in the next hole diagonally , pulling the yarn through to the back (2). That is one continental stitch. The next stitch is started in the hole immediately beneath the one you just came through. Bring your needle from behind and pull the yarn through (3). Then put your needle in the next hole on the diagonal and pull the yarn through to the back (4). Continue in this manner across the row. To make another row, just start below the last stitch made, working the opposite direction. So if your first row was worked left to right, the second will be worked right to left. Never knot your yarn to hold it in place! When you are starting or ending a strand of yarn, you will want to secure it behind several stitches to secure it and ensure that none of your work pulls out. When starting a piece, leave a couple of inches of yarn on the back side. Hold it along the row that you are working and make 10 or so stitches over it to secure. Cut off any excess. The black in the image shows where you should hold the yarn end on the back of your piece so that the stitches will catch it to secure it. When finishing a piece, use your needle to weave an inch or two behind your stitches on the back to secure it. It can be hard to find plastic canvas supplies in stores these days. If craft stores do carry plastic canvas stuff, the selection is usually poor. So I tend to buy most of my supplies online. You can find the best selection on Amazon. Amazon has free shipping on most orders over $35. (Or if you have Prime, shipping is free on everything!) So if I am ordering something else, I like to throw in some plastic canvas supplies to bring my total to $35 to qualify for free shipping. Sometimes it is easier to learn how to do plastic canvas stitches when you are able to watch someone else doing them. This plastic canvas video tutorial will show you how to do the continental stitch (half cross stitch), the mosaic stitch, the gobelin stitch, and the overcast stitch. While you can craft with plastic canvas without these handy little gadgets, they will make things a little bit easier. Counting all those holes or ribs can be tedious when you are cutting out a pattern. A plastic canvas hole/rib counter can make the job a little bit easier. Yarn can be difficult to thread in your needle. 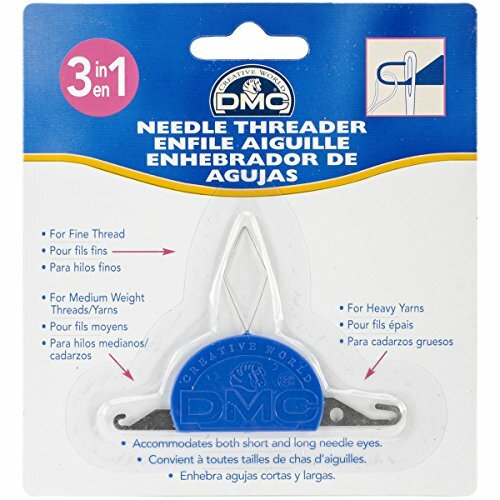 A needle threader makes quick work of it. I use dry erase markers to mark out the pattern on my plastic canvas before cutting it. It saves a lot of time and wasted canvas. When you have finished cutting out the piece, just use a dry cloth to wipe away the marks. 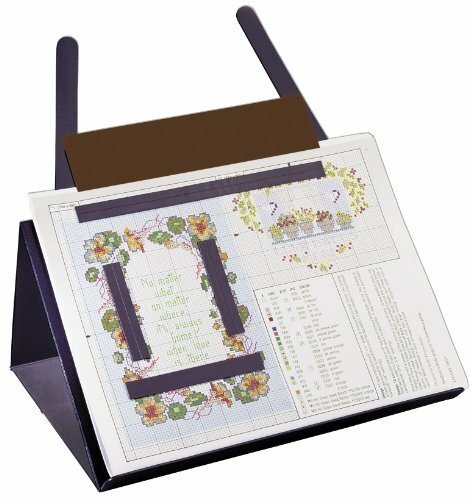 I love using a magnetic chart holder for my plastic canvas patterns. It helps me easily mark my spot when I have to walk away from a project for a bit. I was forever losing needles until I discovered this handy magnetic needle case. Now I keep my plastic canvas needles in a safe spot. Did you know there are over 100 different plastic canvas stitches? This plastic canvas stitch directory will help you add variety and texture to your latest project. 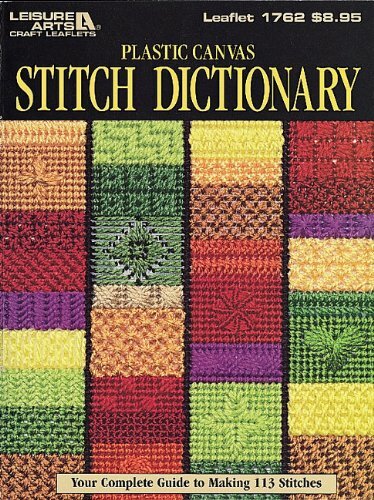 The Plastic Canvas Stitch Dictionary is a book that I personally own and highly recommend. 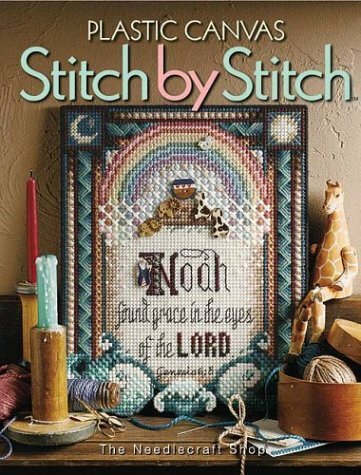 It features 113 different plastic canvas stitches and is my go to guide when I am designing a new project and want to use an unusual stitch to jazz up my project. Have a hint to share? Leave a comment at the bottom of the page, and I will add yours to the list. Use a dry erase marker for marking pattern pieces on your plastic canvas before you cut it. If you make an error, simply wipe it away. 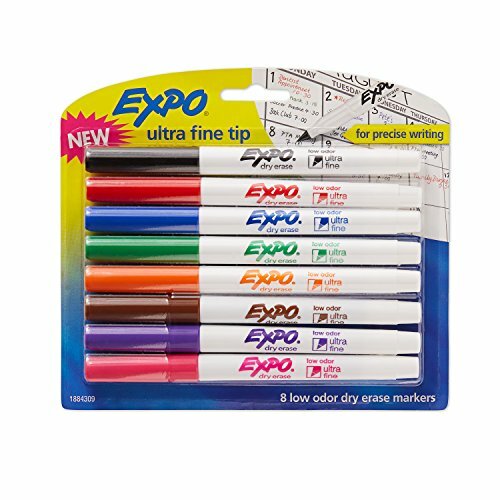 This will keep you from wasting plastic canvas from cutting errors. Did you accidentally cut through a bar? Repair it with a little bit of hot glue and allow it to cool. You won’t be able to tell after you stitch over it. You can also put a small scrap piece of plastic canvas behind the mistake and stitch through both layers to hide your mistake. Nail clippers work great for cutting off the little nubs of plastic canvas left over when you cut out a pattern piece. These nubs can snag your yarn so it’s best to get the edge as smooth as possible. Does your project involve hot glue? Those little strands of glue that occur when you pull the glue gun away will disappear when you blow a hair dryer back and forth over them. Save all your leftover scraps in a small box. You never know when a future project will need small pieces of plastic canvas. 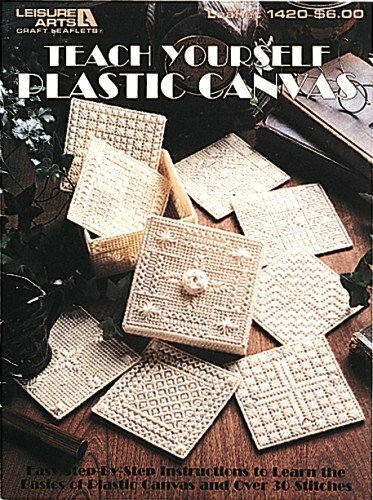 If you would rather learn how to do plastic canvas from a craft booklet instead of sitting in front of your computer, here are some great resources to get you started. They are also a great refresher if you haven’t done any plastic canvas in awhile. After you have learned a few of the basic stitches, you are ready to try out a simple pattern. Small projects like magnets and coasters are a great way to get started with the craft. After you have wet your feet with a few of these easy plastic canvas patterns, then you will be ready to move on to bigger and more complex projects. Super simple plastic canvas pattern for little Crosses. I love the story behind these as well. This free pattern uses a special star plastic canvas shape and long stitches. This would be a quick project for beginners. This cute little box would be great for holding some small sewing essentials like needles, a needle threader, small spools of yarn, etc. This quick and easy project would be a great way to be introduced to 3-D plastic canvas projects. This simple project works up fast and is a great way to use up plastic canvas scraps. This simple plastic canvas project can be stitched in no time at all. A great way to support a loved one with breast cancer. So tell me…Did I leave anything out of this plastic canvas how to guide? If you have anything to add, feel free to leave a comment below. Happy Crafting! Let’s talk about yarn. Is Plastic Canvas Yarn really necessary or can you use regular yarn? If so, do you need to separate plies? Plastic canvas yarn is not necessary. I mostly use Red Heart worsted weight yarn. The advantage of (true) plastic canvas yarn is that is somewhat plastic-y. I don’t know how else to describe it. I think it might have some acrylic in it. It cleans a little bit easier than regular yarn and it doesn’t fray as much either. It is quite hard to find true plastic canvas yarn anymore. Most plastic canvas yarns sold in the big box craft stores are just smaller quantities of worsted weight yarn. You do not need to separate the plies when using regular yarn. Just use the whole strand. Hope that helps!